VACATION was approaching. The schoolmaster, always severe, grew severer and more exacting than ever, for he wanted the school to make a good showing on “Examination” day. His rod and his ferule were seldom idle now—at least among the smaller pupils. Only the biggest boys, and young ladies of eighteen and twenty, escaped lashing. Mr. Dobbins’ lashings were very vigorous ones, too; for although he carried, under his wig, a perfectly bald and shiny head, he had only reached middle age, and there was no sign of feebleness in his muscle. As the great day approached, all the tyranny that was in him came to the surface; he seemed to take a vindictive pleasure in punishing the least shortcomings. The consequence was, that the smaller boys spent their days in terror and suffering and their nights in plotting revenge. They threw away no opportunity to do the master a mischief. But he kept ahead all the time. The retribution that followed every vengeful success was so sweeping and majestic that the boys always retired from the field badly worsted. At last they conspired together and hit upon a plan that promised a dazzling victory. They swore in the signpainter’s boy, told him the scheme, and asked his help. He had his own reasons for being delighted, for the master boarded in his father’s family and had given the boy ample cause to hate him. The master’s wife would go on a visit to the country in a few days, and there would be nothing to interfere with the plan; the master always prepared himself for great occasions by getting pretty well fuddled, and the signpainter’s boy said that when the dominie had reached the proper condition on Examination Evening he would “manage the thing” while he napped in his chair; then he would have him awakened at the right time and hurried away to school. In the fulness of time the interesting occasion arrived. At eight in the evening the schoolhouse was brilliantly lighted, and adorned with wreaths and festoons of foliage and flowers. The master sat throned in his great chair upon a raised platform, with his blackboard behind him. He was looking tolerably mellow. Three rows of benches on each side and six rows in front of him were occupied by the dignitaries of the town and by the parents of the pupils. To his left, back of the rows of citizens, was a spacious temporary platform upon which were seated the scholars who were to take part in the exercises of the evening; rows of small boys, washed and dressed to an intolerable state of discomfort; rows of gawky big boys; snowbanks of girls and young ladies clad in lawn and muslin and conspicuously conscious of their bare arms, their grandmothers’ ancient trinkets, their bits of pink and blue ribbon and the flowers in their hair. All the rest of the house was filled with non-participating scholars. The exercises began. A very little boy stood up and sheepishly recited, “You’d scarce expect one of my age to speak in public on the stage,” etc.—accompanying himself with the painfully exact and spasmodic gestures which a machine might have used—supposing the machine to be a trifle out of order. But he got through safely, though cruelly scared, and got a fine round of applause when he made his manufactured bow and retired. A little shamefaced girl lisped, “Mary had a little lamb,” etc., performed a compassion-inspiring curtsy, got her meed of applause, and sat down flushed and happy. Tom Sawyer stepped forward with conceited confidence and soared into the unquenchable and indestructible “Give me liberty or give me death” speech, with fine fury and frantic gesticulation, and broke down in the middle of it. A ghastly stage-fright seized him, his legs quaked under him and he was like to choke. True, he had the manifest sympathy of the house but he had the house’s silence, too, which was even worse than its sympathy. The master frowned, and this completed the disaster. Tom struggled awhile and then retired, utterly defeated. There was a weak attempt at applause, but it died early. “The Boy Stood on the Burning Deck” followed; also “The Assyrian Came Down,” and other declamatory gems. Then there were reading exercises, and a spelling fight. The meagre Latin class recited with honor. The prime feature of the evening was in order, now—original “compositions” by the young ladies. Each in her turn stepped forward to the edge of the platform, cleared her throat, held up her manuscript (tied with dainty ribbon), and proceeded to read, with labored attention to “expression” and punctuation. The themes were the same that had been illuminated upon similar occasions by their mothers before them, their grandmothers, and doubtless all their ancestors in the female line clear back to the Crusades. “Friendship” was one; “Memories of Other Days”; “Religion in History”; “Dream Land”; “The Advantages of Culture”; “Forms of Political Government Compared and Contrasted”; “Melancholy”; “Filial Love”; “Heart Longings,” etc., etc. 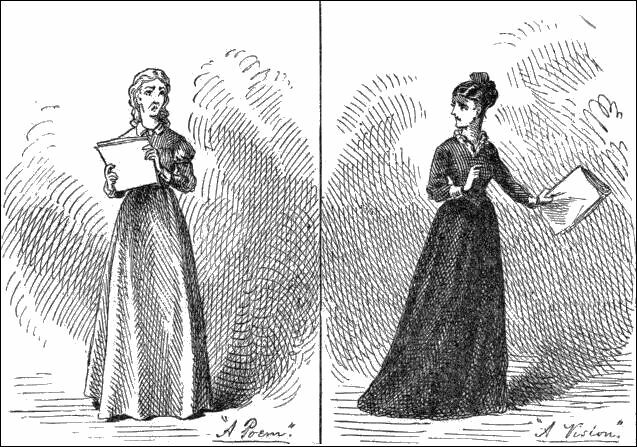 A prevalent feature in these compositions was a nursed and petted melancholy; another was a wasteful and opulent gush of “fine language”; another was a tendency to lug in by the ears particularly prized words and phrases until they were worn entirely out; and a peculiarity that conspicuously marked and marred them was the inveterate and intolerable sermon that wagged its crippled tail at the end of each and every one of them. No matter what the subject might be, a brainracking effort was made to squirm it into some aspect or other that the moral and religious mind could contemplate with edification. The glaring insincerity of these sermons was not sufficient to compass the banishment of the fashion from the schools, and it is not sufficient today; it never will be sufficient while the world stands, perhaps. There is no school in all our land where the young ladies do not feel obliged to close their compositions with a sermon; and you will find that the sermon of the most frivolous and the least religious girl in the school is always the longest and the most relentlessly pious. But enough of this. Homely truth is unpalatable. “In the common walks of life, with what delightful emotions does the youthful mind look forward to some anticipated scene of festivity! Imagination is busy sketching rose-tinted pictures of joy. In fancy, the voluptuous votary of fashion sees herself amid the festive throng, ‘the observed of all observers.’ Her graceful form, arrayed in snowy robes, is whirling through the mazes of the joyous dance; her eye is brightest, her step is lightest in the gay assembly. And so forth and so on. There was a buzz of gratification from time to time during the reading, accompanied by whispered ejaculations of “How sweet!” “How eloquent!” “So true!” etc., and after the thing had closed with a peculiarly afflicting sermon the applause was enthusiastic. “Alabama, goodbye! I love thee well! ‘Tis to no strangers left I yield these sighs. There were very few there who knew what “tete” meant, but the poem was very satisfactory, nevertheless. This nightmare occupied some ten pages of manuscript and wound up with a sermon so destructive of all hope to non-Presbyterians that it took the first prize. This composition was considered to be the very finest effort of the evening. The mayor of the village, in delivering the prize to the author of it, made a warm speech in which he said that it was by far the most “eloquent” thing he had ever listened to, and that Daniel Webster himself might well be proud of it. It may be remarked, in passing, that the number of compositions in which the word “beauteous” was over-fondled, and human experience referred to as “life’s page,” was up to the usual average. Now the master, mellow almost to the verge of geniality, put his chair aside, turned his back to the audience, and began to draw a map of America on the blackboard, to exercise the geography class upon. But he made a sad business of it with his unsteady hand, and a smothered titter rippled over the house. He knew what the matter was, and set himself to right it. He sponged out lines and remade them; but he only distorted them more than ever, and the tittering was more pronounced. He threw his entire attention upon his work, now, as if determined not to be put down by the mirth. He felt that all eyes were fastened upon him; he imagined he was succeeding, and yet the tittering continued; it even manifestly increased. And well it might. There was a garret above, pierced with a scuttle over his head; and down through this scuttle came a cat, suspended around the haunches by a string; she had a rag tied about her head and jaws to keep her from mewing; as she slowly descended she curved upward and clawed at the string, she swung downward and clawed at the intangible air. The tittering rose higher and higher—the cat was within six inches of the absorbed teacher’s head—down, down, a little lower, and she grabbed his wig with her desperate claws, clung to it, and was snatched up into the garret in an instant with her trophy still in her possession! And how the light did blaze abroad from the master’s bald pate—for the signpainter’s boy had gilded it! NOTE:—The pretended “compositions” quoted in this chapter are taken without alteration from a volume entitled “Prose and Poetry, by a Western Lady”—but they are exactly and precisely after the schoolgirl pattern, and hence are much happier than any mere imitations could be.